1. Damodar Valley Corporation v. Central Elec. Regulatory Comm. Damodar Valley Corporation Act, 1948 - Legality of taking into consideration the cumulative depreciation for reducing the loan component. Narcotic Drugs and Psychotropic Substances Act, 1985 - Ss. 21 & 22 - Drugs and Cosmetics Act, 1940 - the N.D.P.S Act, should not be read in exclusion to Drugs and Cosmetics Act, 1940 - it is the prerogative of the State to prosecute the offender in accordance with law - Since the action of the accused amounted to a prima­facie violation of Section 8 of the N.D.P.S Act, they were charged under Section 22 of the N.D.P.S Act - decision rendered by the High Court holding that the accused must be tried under the Drugs and Cosmetics Act, 1940 instead of the N.D.P.S Act, as they were found in possession of the “manufactured drugs”, does not hold good in law. Industrial Areas Development Act, 1966 (Karnataka) - Section 28(1) - the Special Deputy Commissioner determined the market rate of the land in question at Rs.500/­ per Gunta whereas the Reference Court fixed the compensation at the rate of Rs.21,000/­ per Gunta. The High Court, however, reduced it to Rs.10,250/­ per Gunta - the market rate determined by the reference Court at the rate of Rs.21,000/­ per Gunta was the proper market rate of the land in question and the same, therefore, should have been upheld by the High Court. 4. Shri H.D. Shrma v. Northern India Textile Res. Assn. Industrial Disputes - In order that any payment is regarded as “wages”, it must be proved that it was being paid by the employer to his employee 21 pursuant to the terms of his employment. It is only then a right is created in employee’s favour to claim such amount from the employer provided the employee proves that he has fulfilled the terms of his employment. Natural Justice - Principle of - No order can be passed by any Court in any judicial proceedings against any party to such proceedings without hearing and giving such party an opportunity of hearing. 6. Roshina T. v. Abdul Azeez K.T. Constitution of India - Article 226 - A dispute regarding possession of the flat between the two private individuals could be decided only by the Civil Court in civil suit or by the Criminal Court in Section 145 Cr.P.C proceedings but not in the writ petition under Article 226 of the Constitution. Auction - did not give adequate publicity - committed an error in fixing reserve price of the land at a very less amount - the value and the potential of the land, should have given adequate publicity in the leading national English, Hindi newspapers having circulation all over the country including any other prescribed mode of publication with a sole object to attract participation of more and more persons in the auction proceedings - the land in question deserves to be re­auctioned afresh. Possession - In order to prove that the possession of any person in any immovable property is legal, it is necessary for such person to prove prima facie that he is either the owner of such property or is in possession as a lawful tenant or is in its permissive possession with the express consent of its true owner. Remand - the parties were entitled for a decision of their case on merits by the Appellate Court (Commissioner) and then by the High Court in its writ jurisdiction. In this case, neither the Commissioner could record any finding on the merits and nor the High Court. It is for this reason, we are inclined to prefer the second option and while giving effect to the impugned order remand the case (appeal) to the Commissioner to enable him to examine the merits of the case in accordance with law. Remand - the examination could be confined only to the issue of remand and not beyond it. At the same time, there was no need to cite several decisions and that too in detail. Brevity being a virtue, it must be observed as far as possible while expressing an opinion. Industrial Disputes Act, 1947 - S. 25F - Conditions precedent to retrenchment of workmen - Once it is established that the Appellant had voluntarily abandoned her service, she could not have been in “continuous service” as defined under S. 2(oo) the I.D. Act, 1947. S. 25F of the I.D. Act, 1947 lays down the conditions that are required to be fulfilled by an employer, while terminating the services of an employee, who has been in “continuous service” of the employer. Hence, S. 25F of the I.D. Act, would cease to apply on her. 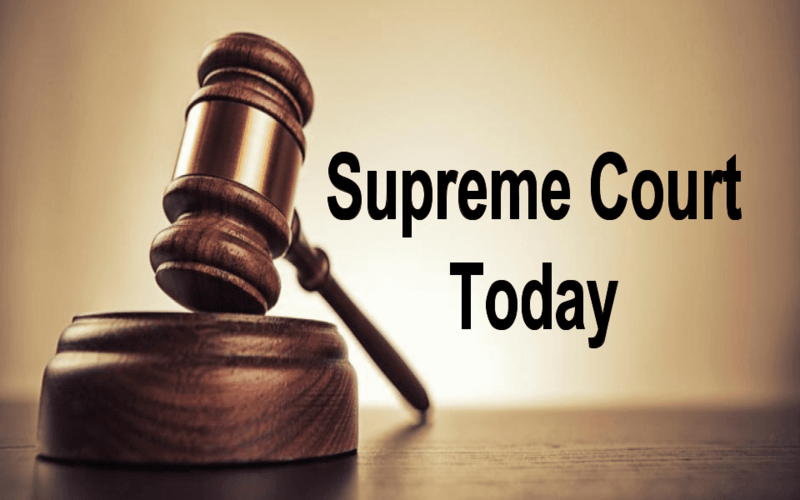 Indian Penal Code, 1860 - Section 302 - Code of Criminal Procedure, 1973 - Section 386 (b) - Powers of the Appellate Court - The need to remand the case has been occasioned because, the Division Bench has neither discussed any issue arising in the case nor appreciated the evidence and nor recorded its findings on any of the issues arising in the case and urged by the appellant. The Division Bench should have examined the evidence of each prosecution witnesses on issues arising in the case and the same 4 should have been examined in the light of the challenge made by the accused in appeal and then a finding should have been recorded either of affirmation or modification or reversal, as the case may be. Code of Criminal Procedure, 1973 - Section 482 - Indian Penal Code, 1860 - Sections 498­A and 323 - Dowry Prohibition Act, 1961 - Sections 3 and 4 - Whether the High Court was justified in dismissing the appellants’ applications filed under Section 482 of the Code. Code of Criminal Procedure, 1973 - Section 482 - Indian Penal Code, 1860 - Sections 498A, 304B - Dowry Prohibition Act, 1961 - Section 3/4 - the Single Judge has only quoted the principles of law laid down by this Court in several decisions relating to powers of the High Court to interfere in the cases filed under Section 482 of the Code from Para 2 to the concluding para but has failed to even refer to the facts of the case with a view to appreciate the factual controversy, such as, what is the nature of the complaint/FIR filed against the appellants, the allegations on which it is filed, who filed it, the grounds on which the complaint/FIR/proceedings is challenged by the appellants, why such grounds are not made out under Section 482 of the Code etc. We are, therefore, at a loss to know the factual matrix of the case much less to appreciate except to read the legal principles laid down by this Court in several decisions. Code of Criminal Procedure, 1973 - Section 482 - the Single Judge has not mentioned the bare facts of the case with a view to appreciate the factual controversy, such as, what is the nature of the complaint/FIR filed against the appellants, the allegations on which it is filed, the offences under which appellants prosecution is sought, who filed the complaint/FIR/proceedings, whether it pertains to a cognizable offence or not, the grounds on which the complaint/FIR/ proceedings is challenged, why such grounds are not made out under Section 482 of the Code etc. The case is remanded to the High Court for its decision on merits.